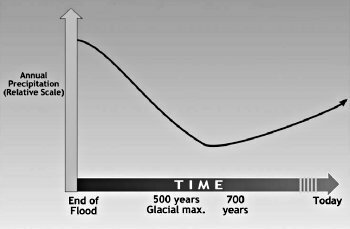 We have developed the post-Flood Ice Age model based on the climatic aftermath of the Genesis flood. Now we are in a position to delve into the mysteries of the woolly mammoth. The questions surrounding the life and death of woolly mammoths have fueled many hypotheses by both evolutionists and creationists. Advocates of the creation-Flood model have drawn up several competing hypotheses because the information on the woolly mammoths is confusing and most of the research is published in Russian. 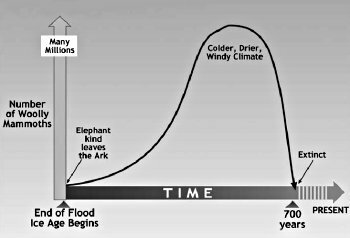 Some creationists explain the mammoth demise by the Flood in the same way as the dinosaurs disappeared. They usually advocate a quick freeze as the mechanism for their extinction and preservation, at least in the permafrost of Siberia. Other creationists have concluded that the mammoths lived during the Ice Age and became extinct at the end of the Ice Age, as uniformitarian scientists also believe. Those who believe the woolly mammoths died at the end of the Ice Age are divided on whether there was a quick freeze or not. The quick freeze hypothesis will be discussed in the next chapter. Undoubtedly, there were woolly mammoths as well as a great variety of other elephants living before the Flood. We should expect some of these types of elephants, including the mammoths, to have fossilized during the Flood. So, it is possible that mammoths could have been fossilized either during the Flood or after the Flood or both. 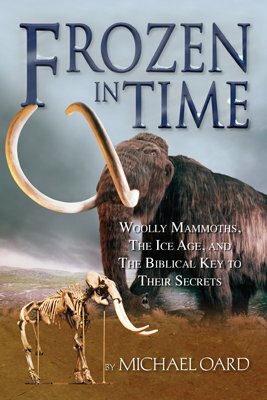 The woolly mammoths that are the focus of this book are nearly all found in unconsolidated or frozen surficial sediments, indicating they lived during the Ice Age following the Flood (see appendix 4). This would include the frozen mammoth remains in Siberia, Alaska, and the Yukon. 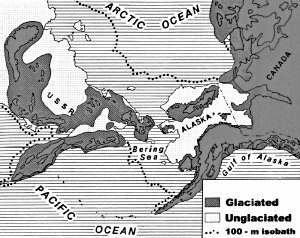 Why were the lowlands of Siberia, Alaska, and the Yukon unglaciated? Figure 14.1. Winter temperature changes in centigrade at polar latitudes with just the removal of the Arctic sea ice cap, leaving the temperature of the ocean at freezing. Figure 14.2. The main storm track is well off eastern Asia, with warm onshore flow from the air heated by the warm Arctic and North Pacific Ocean. Since the woolly mammoths lived by the millions in Siberia, Alaska, and the Yukon, the question naturally comes up of how they could have lived there during the Ice Age. They actually inhabited unglaciated areas, which is a major mystery of the uniformitarian view of the Ice Age (see figure 2.3). Climate simulations, using uniformitarian assumptions, often show these areas to be the first to glaciate. In the post-Flood Ice Age model presented in this book, the lowlands would not glaciate because of the warm Arctic and Pacific Oceans. The Arctic Ocean, because of its polar latitude, would rapidly lose heat and moisture to the atmosphere, which would help warm the surrounding lands in the winter. Newson1 demonstrated the dramatic climatic consequences of a warm Arctic Ocean by an atmospheric circulation simulation. He used a climate model to study the effects of removing the sea ice from the higher latitudes, but keeping the surface temperature of the Arctic Ocean at the freezing point of seawater. He ran the climate model with and without sea ice, leaving every other variable in the climate model the same. By comparing the two model runs, he discovered that winter atmospheric temperatures over the Arctic Ocean warmed 40 to 70°F (20 to 40°C)! Furthermore, the warmer temperatures spread to the adjacent lands (figure 14.1). The winter air temperatures over Siberia and Canada warmed 20 to 50°F (12 to 28°C). If the temperature of the Arctic Ocean were much warmer than the freezing point of seawater, as in the post-Flood Ice Age model, the warmth of the air would have been significantly warmer than in Newson’s simulation. 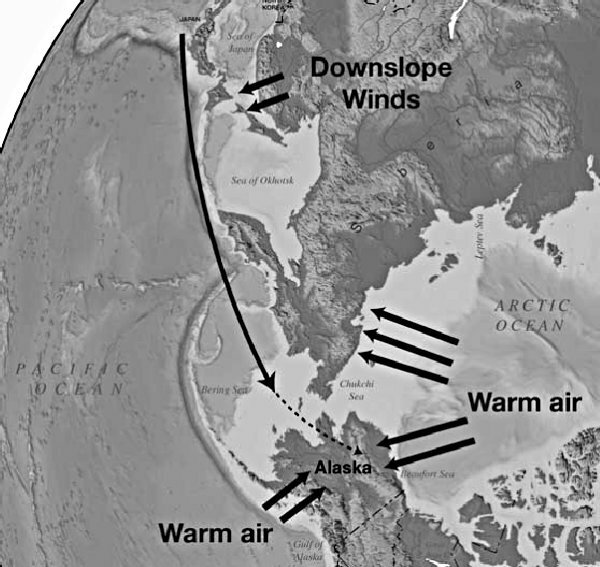 Figure 14.2 shows how Siberia, Alaska, and the Yukon would have been warmed by the onshore flow of relatively warm air that was heated by warm water from the Arctic and North Pacific Oceans. The warm air would have kept the lowlands of Siberia, Alaska, and the Yukon from developing glaciers while the mountains of the area rapidly glaciated. Since there was no ice to stop the mammoths spreading into Siberia, how did they spread to the rest of the Northern Hemisphere where we find their remains today? The woolly mammoth appears to have descended from one Genesis kind (see appendix 3 for an explanation of the elephant kind, including mammoths, within the new creationist subfield of baraminology). Whether two woolly mammoths descended from the ark, or whether the woolly mammoths developed from the genes of two elephants that had a large gene pool, they would have multiplied slowly after the Flood — at first. As the Ice Age progressed, their numbers would have increased rapidly due to the power of geometric progression. There was plenty of time for their population to increase to many tens of millions during a 700-year Ice Age (see “Mammoth population explosion” later in this chapter). It would be no trouble for them to migrate into Europe and western Asia from the mountains of Ararat. The migration of the mammoths into the United States is the main challenge. Once they made it to Siberia, they could eventually spread into Alaska. The Bering Sea and the Bering Strait, as well as the continental shelves around Siberia and Alaska, are very shallow. As ice collected on the land, the sea level dropped enough to provide a land bridge between Siberia and Alaska. The mammoths and many other animals spread from Siberia into Alaska and the Yukon over the Bering Land Bridge.2 Accompanying them were the small mammals, like the shrew and the meadow mouse. Animals that cannot tolerate very cold conditions could have made it to North America by this route early in the Ice Age when the winter temperatures were much warmer than today. During this time of migration and dispersal, the climate of the entire Northern Hemisphere was characterized by mild winters and cool summers. Figure 14.3 is a schematic of postulated winter and summer temperatures for Siberia since the Flood. The small change in seasonal temperatures allowed the animals and plants that preferred a cold climate to mix with those that preferred a mild climate. These disharmonious associations are frequently found in Ice Age deposits, and explain another mystery of the Ice Age (see chapter 1). In chapter 2, we established that the current environment of Siberia is very inhospitable to woolly mammoths and other mammals. How would the post-Flood Ice Age have been different to allow the mammoths to spread into Siberia and beyond? After leaving the ark, the mammoths would have gradually grazed their way northeast, eventually reaching Siberia. When they arrived, the Ice Age likely had just begun. The Siberian winters would have been mild and the summers cool with little contrast between the seasons. The environment would have been much different than today, allowing the woolly mammoths to migrate in and through Siberia. This increases the danger of circular reasoning. For instance, it hardly would be correct to conclude that the last interglacial was the warmest in the region when such a conclusion was based on the sites where deposits are assigned to this age because they appear to represent the warmest climate in regional sequence. The indications of warmer winters includes: (1) large trees found in growth position within the permafrost of the far north,6 (2) some plants associated with carcasses that grow more than 600 miles (1,000 km) to the south,7 (3) insects that belong in a significantly warmer climate,8 (4) many of the Siberian and Alaskan animals that survive today but live much farther south,9 and (5) the marine sediments in northern Siberia and Alaska below the mammoth steppe that contain a warmer fauna indicating water temperatures 7–14°F (4–8°C) warmer than today.10 The vegetation in the stomach of the Beresovka mammoth was at first claimed to support the current tundra climate, but a re-analysis indicated some of it grew much farther south.11 The vegetation that grows in Siberia today, such as buttercups, do also grow in a warmer climate. The animals and environment of Siberia indicate the Ice Age climate began with mild winters (figure 14.3). A wetter climate would also occur immediately after the Flood due to the onshore flow of moist air from the Arctic and North Pacific Oceans (see figure 14.2). Since warm air holds more water vapor, and because copious evaporation would occur from the warm Arctic Ocean, the precipitation following the Flood would have been heavy in Siberia, Alaska, and the Yukon. This greater precipitation probably caused these regions to have been generally forested early in the Ice Age, a situation that apparently is verified by the finding of trees and in situ stumps within the surficial sediments. As the Ice Age progressed, the Arctic Ocean would gradually cool off, resulting in significantly less evaporation. The cooling winter and summer temperatures would also result in a gradually drying atmosphere. Since summers would have been cooler than normal due to volcanic dust and gases, summer showers and thunderstorms would have been mostly suppressed. Usually, large-scale cool-season storms weaken in the summer, and since summer showers would be less than today, summers would be generally dry during the mid and late Ice Age period. Thus, the climate of Siberia would gradually dry with time since the start of the Ice Age (figure 14.4). The environment would change from a generally forested landscape to a vast grassland or steppe environment about midway into the Ice Age. A grassland is favored by relatively mild winter temperatures, abundant cool season precipitation, and dry summers, such as occurs on the high plains of North America today. Grass from a steppe environment is vegetation the mammals could eat, unlike the bog vegetation that grows there today. The mammals would have plenty of grass to eat over the wide expanse of Siberia. This scenario would solve what uniformitarian scientists call “the productivity paradox,” a condition where way too many animals thrived for the amount of food thought to be available. Even after the Arctic Ocean surface cooled to the freezing point of seawater, it would still not freeze over. (At the freezing point, Newson’s simulation would be the most applicable.) There are a number of reasons for this, but this would largely be due to the difficulty of freezing saltwater and because of the water circulation in the Arctic Ocean. The Arctic Ocean would most likely remain ice free throughout the Ice Age — until deglaciation when meltwater floated over the saltwater and froze. It is the permafrost, which is permanently frozen ground, in Siberia today that causes the bogs and keeps mammals from migrating into Siberia in the summer. With so many mammals in Siberia during the Ice Age, the winters must have been warm enough to inhibit the growth of permafrost. Permafrost today is divided up into discontinuous and continuous zones. Discontinuous permafrost forms when the annual average temperature is around 30°F (-1°C), while continuous permafrost forms when the annual average temperature has fallen to 20°F (-7°C) or below.12 Continuous permafrost over the non-glaciated areas of Siberia probably did not occur until late in the Ice Age (figure 14.5). Little or no permafrost during the early and mid Ice Age is unthinkable to uniformitarian scientists. However, there is substantial evidence that this was indeed the case. Many of the mammals that lived in Siberia would have had great difficulty walking on a boggy substrate, especially the woolly mammoth and saiga antelope (see chapter 2). The saiga antelope, with its small hooves, is strong evidence for the lack of permafrost. The antelope now lives on the steppes of southern Siberia. Their highly specialized hooves favor open, level terrain and cannot navigate on boggy substrate or in deep snow.13 Sher14 notes: “In the Pleistocene, as today, the saiga could not move over mushy, boggy ground or in deep snow.” And yet, Ice Age fossils of saiga antelope are found throughout Siberia, even on the New Siberian Islands, in Alaska and in the Yukon (see figure 2.4). In Alaska, they are found in the interior and near the Arctic Ocean. The only one found in the Yukon is near the Arctic coast, east of MacKenzie delta, indicating that the northwest Laurentide ice sheet delayed in developing along the Arctic coast. This delay seems anomalous within the uniformitarian Ice Age model, while it is expected in the post-Flood Ice Age model due to the warm Arctic Ocean to the north. A few evolutionary scientists attempt to reconcile the saiga antelope fossils by reasoning that the ground was permanently frozen.15 In this way the antelope could run all over Siberia during the Ice Age. If the ground were permanently frozen, what would the saiga antelope and other animals eat? It is also questionable whether the animals could survive such a cold climate. Many animals that lived in the far north during the Ice Age now live much farther south in a more temperate climate. Beaver fossils and beaver-cut wood also indicate a lack of permafrost in Siberia, Alaska, and the Yukon during part of the Ice Age. (This assumes that the interpretation of beaver-cut wood is correct.) Quackenbush16 believes he discovered the frozen remains of a beaver dam in northwest Alaska. Beavers do not like permafrost, because only the top two feet melt during the summer and refreeze in the winter. Deep-burrowing animals, such as the badger and ferret, lived in Siberia during the Ice Age, providing further evidence that for a period of time there was no permafrost. The most straightforward interpretation of the animal data is that the Ice Age winters were much warmer, and the permafrost did not develop until late in the Ice Age. Hippopotami are found together with reindeer and woolly mammoth fossils in northwest Europe (see chapter 1). This is probably the most dramatic example of a disharmonious association, but such associations were common during the Ice Age. The unique climate — mild winters and cool summers — during the post-Flood rapid Ice Age resulted in disharmonious associations. Specifically, the situation of the hippos associated with cold climate animals can be explained by realizing that northwest Europe would have been bathed in warm onshore flow early in the Ice Age. The hippos would find an agreeable environment from which to spread across Europe and into southern England. As the Ice Age progressed and the ocean water cooled, the climate of northwest Europe would cool with time. Toward the end of the Ice Age the mountains and lowlands of the British Isles finally glaciated. During this time, the animals that preferred the cold migrated across another land bridge over the shallow southern North Sea and into southern England. There they mixed with the climatically stressed hippos occupying the area. This would explain how some of the cold-tolerant animals lived temporarily with the hippos and ended up being buried together. Disharmonious associations still remain almost a complete mystery to uniformitarian scientists, but are anticipated in the post-Flood Ice Age model. However, uniformitarian scientists are not without hypotheses. Appendix 2 critiques the four main uniformitarian explanations for Ice Age disharmonious associations. Around 10 million woolly mammoths lie buried in Siberia alone. With an Ice Age of only 700 years, people question whether that was enough time for them to have grown to such a large population. We can estimate the mammoth population explosion after the Flood by examining the reproductive habits of the African elephant. The elephant reproductive rate can vary a fair amount.24 Elephants do not reach sexual maturity until they are 10 to 23 years old.25 They live 50 to 60 years. McDonald26 states that modern elephants usually have one calf per litter and give birth every 5 years, although the time can be shorter. Haynes27 recorded that an elephant female can give birth from 3 to 9 years apart in Hwange National Park, Zimbabwe, resulting in 5 to 15 calves in a lifetime. Eltringham28 states that elephants generally produce a calf at intervals of 4 to 5 years with twins 1.35 percent of the time. However, some have suggested that elephants can give birth every 2 to 3 years, and there is a case of a zoo elephant giving birth 2 years and 5 months after its first birth.29 If an elephant does not become pregnant right away, she has another cycle in 2 months. So she does not have to wait another 2 to 5 years, but can become pregnant soon after a failed pregnancy. Once pregnant, the gestation period is 21 to 22 months and the calf suckles for about 2 years. Based on tusk growth rate, Fisher30 determined that mastodons can reach sexual maturity at 10 years old and give birth every 2 to 6 years. The reproductive rate is especially enhanced in a favorable environment and when the population is low or the animals are being hunted regularly.31 There are no natural enemies for a mature elephant, except man,32 but calves are subject to predation. Calf mortality rises during drought years, especially for males.33 When a calf dies, the mother elephant conceives sooner than expected — around 20 months later.34 Elephants are fairly adaptable to various environments35 and migrate short distances during the dry season in Africa. They are mostly grazers but can also browse leaves from trees and bushes.36 So, the elephant is quite hardy and can potentially reproduce fairly quickly in a favorable environment. Based on these variables, it would be difficult to estimate the growth of the woolly mammoth population during the Ice Age. A shortcut is to estimate woolly mammoth doubling rate by comparing them to the reproductive rates for various herds of African elephants for which there is data. Haynes37 reports that in Hwange National Park, the elephant population increased from 13,000 to 22,000 in 20 years. This a doubling rate of about 25 years. This reproductive rate is in spite of poaching and drought. 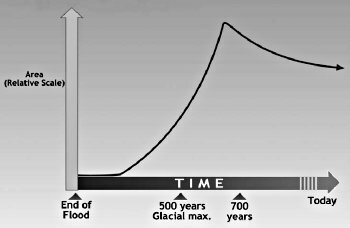 If mammoths increased at this rate, there would be eight million living mammoths within 550 years after the Flood.38 However, the elephant reproductive rate can be significantly faster. Mithen39 states that population increases of 3 to 5 percent per year are commonly reported for African elephants. At a 4 percent rate, doubling about every 18 years, there would be 657 million mammoths in 500 years. Mithen40 also reports that in Addo National Park, South Africa, the population increased 7 percent per year for 27 years, which is likely the maximum possible growth rate in Africa today. This is a doubling time of about 10 years, which is the estimate I had previously used for mammoths.41 At this doubling rate there would be 1.3 billion mammoths living three hundred years after the Flood! This estimate probably is close to the mammoth reproduction rate, especially in the early years after the Flood when the number of predators was still small and the environment more ideal. So, there is no problem accounting for millions of woolly mammoths during a 700-year Ice Age. 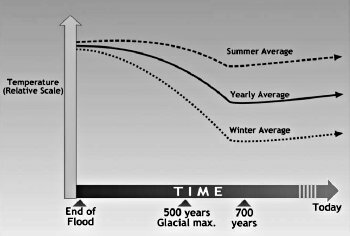 Figure 14.6 shows the time-line for the number of mammoths from the end of the Flood to the end of the Ice Age. From the remains of mammoths in Siberia and Alaska, the mammoth population was apparently healthy with little sign of predation. Guthrie42 reports that most mammoths lived to a ripe old age based on teeth wear. The above reproduction rates are estimates for the potential number of mammoths living near the end of the Ice Age. They do not include the many more that lived during the Ice Age that could potentially have become fossils. Previous Chapter Where Was Man During the Ice Age? Next Chapter Were Siberian Mammoths Quick Frozen? Newson, R.L., Response of a general circulation model of the atmosphere to removal of the Arctic ice-cap, Nature 241:39–40, 1973. Oard, M.J., An Ice Age Caused by the Genesis Flood, Institute for Creation Research, El Cajon, CA, pp. 84–86, 1990. Agenbroad, L.D. and L. Nelson, Mammoths: Ice Age giants, Lerner Publications Company, Minneapolis, MN, p. 22, 2002. For example, in Ukraintseva, V.V., Vegetation of warm Late Pleistocene intervals and the extinction of some large herbivorous mammals, Polar Geography and Geology 4:189–203, 1981. 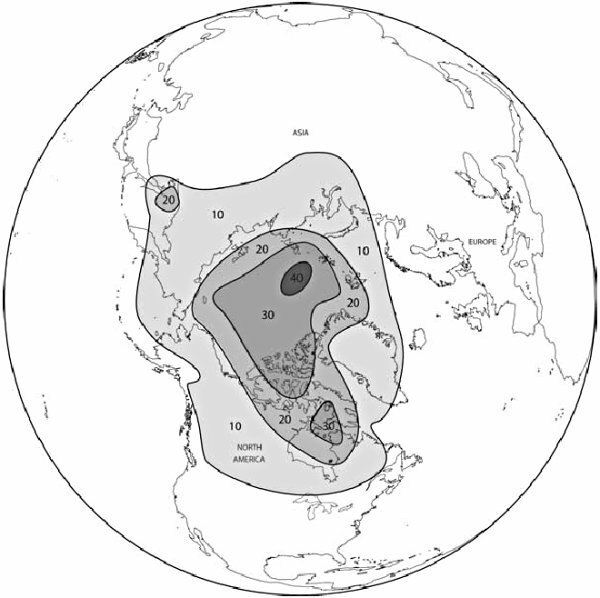 Sher, A.V., Problems of the last interglacial in Arctic Siberia, Quaternary International 10–12:215, 1991. Quackenbush, L.S., Notes on Alaskan mammoth expedition of 1907 and 1908, Bulletin of the American Museum of Natural History 25:126, 1909. Kaplina, T.N., and A.V. Lozhkin, Age and history of accumulation of the “ice complex” of the maritime lowlands of Yakutia; in: Late Quaternary environments of the Soviet Union, A.A. Velichko (Ed. ), University of Minnesota Press, Minneapolis, MN, pp. 147–151, 1984. Guthrie, R.D., Frozen fauna of the mammoth steppe — The story of Blue Babe, University of Chicago Press, Chicago, IL, p. 185, 1990. Ukraintseva, Vegetation and extinction. Ukraintseva, V.V., Vegetation cover and environment of the “Mammoth Epoch” in Siberia, Mammoth Site of Hot Springs, South Dakota, Inc., Hot Springs, SD, 1993. Matthews Jr., J.V., Quaternary environments at Cape Deceit (Seward Peninsula, Alaska): Evolution of a tundra ecosystem, Geological Society of America Bulletin 85:1364–1365, 1974. Kiselev, S.V., and V.I. Nazarov, Late Pleistocene insects; in: Late Quaternary environments of the Soviet Union, A.A. Velichko (Ed. ), University of Minnesota Press, Minneapolis, MN, pp. 223–226, 1984. Berman, D., S. Armbruster, A. Alfimov, and M. Edwards, Subarctic steppe communities in Beringia; in: Bridges of the science between North America and the Russian Far East, 45th Arctic science conference, section 2 — Beringia revisited: Recent discoveries and interpretations, p. 10, 1994. Guthrie, R.D., Frozen fauna of the mammoth steppe — The story of Blue Babe, University of Chicago Press, Chicago, IL, pp. 310–311, 1990. Larsen, E., S. Funder, and J. Thiede, Late Quaternary history of northern Russia and adjacent shelves — A synopsis, Boreas 28:6, 1999. Mangerud, J., J.I. Svendsen, and V.I. Astakhov, Age and extent of the Barents and Kara ice sheets in Northern Russia, Boreas 28:46–80, 1999. Ukraintseva, V.V., Vegetation cover and environment of the “Mammoth Epoch” in Siberia, Mammoth Site of Hot Springs, South Dakota, Inc., Hot Springs, SD, p. 18, 1993. Washburn, A.L., Geocryology: A survey of periglacial processes and environments, John Wiley & Sons, New York, p. 26, 1980. Sher, A.V., Fossil saiga in northeastern Siberia and Alaska, International Geology Review 10(11):1247–1260, 1968. Harington, C.R., Pleistocene saiga antelopes in North America and their paleoenvironmental implications; in: Quaternary Paleoclimate, W.C. Mahaney (Ed. ), Geo Abstracts, Norwich, England, pp. 193–225, 1981. Sher, A.V., Fossil saiga in northeastern Siberia and Alaska, International Geology Review 10(11):1252, 1968. Sher, A.V., Fossil saiga in northeastern Siberia and Alaska, International Geology Review 10(11):1247–1260, 1968. Quackenbush, L.S., Notes on Alaskan mammoth expedition of 1907 and 1908, Bulletin of the American Museum of Natural History 25:87–130, 1909. Haynes, G., Mammoths, mastodonts, and elephants, Cambridge University Press, Cambridge, NY, 1991. Sarfati, J., Mammoth — Riddle of the Ice Age>, Creation 22(2):10–15, 2000. Haynes, Mammoths, mastodonts, and elephants, pp. 22–24. Höss, M., S. Pääbo, and N.K. Vereshchagin, Mammoth DNA sequences, Nature 370:333, 1994. Agenbroad, L.D., and J.I. Mead, Quaternary geochronology and distribution of Mammuthus on the Colorado Plateau, Geology 17:861–864, 1989. Haynes, Mammoths, mastodonts, and elephants, p. 59. Haynes, Mammoths, mastodonts, and elephants, p. 106. Laws, R.M., I.S.C. Parker, and R.C.B. Johnstone, Elephants and their habitats — The ecology of elephants in North Bunyoro, Uganda, Clarendon Press, Oxford, pp. 204–227, 1975. Pilgram, T., and D. Western, Inferring hunting patterns on African elephants from tusks in the international ivory trade, Journal of Applied Ecology 23:503–514, 1986. McDonald, J.N., The reordered North American selection regime and Late Quaternary megafaunal extinctions; in: Quaternary extinctions: A prehistoric revolution, P.S. Martin and R.G. Klein (Eds. 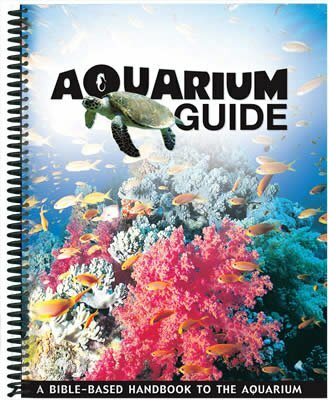 ), University of Arizona Press, Tucson, AZ, pp. 421, 428, 1984. Haynes, Mammoths, mastodonts, and elephants, p. 65. Eltringham, S.K., Elephants, Blandford Press, Dorset, England, 1982. Fisher, D.C., Extinction of proboscideans in North America; in: The Proboscidea — Evolution and palaeoecology of elephants and their relatives, J. Shoshani and P. Tassy (Eds. ), Oxford University Press, New York, p. 310, 1996. Laws, Parker, and Johnstone, Elephants and their habitats. Eltringham, Elephants, pp. 84–88. Lee, P.C., and C.J. Moss, Early maternal investment in male and female African elephant calves, Behavioral Ecology and Sociobiology 18:358, 1986. Haynes, Mammoths, mastodonts, and elephants, p. 65. Ward, P.D., The call of distant mammoths — Why the Ice Age mammoths disappeared, Springer-Verlag, New York, p. 219, 1997. Ward, P.D., The call of distant mammoths — Why the Ice Age mammoths disappeared, Springer-Verlag, New York, p. 132, 1997. Lee, P.C., and C.J. Moss, Early maternal investment in male and female African elephant calves, Behavioral Ecology and Sociobiology 18:353, 1986. Lee and Moss, Early maternal investment, p. 358. Fisher, Extinction of proboscideans, p. 310. Ward, Call of distant mammoths, p. 133. Haynes, Mammoths, mastodonts, and elephants. Sarfati, J., How did millions of mammoth fossils form? Creation 21(4):56, 1999. Mithen, S., Simulating mammoth hunting and extinction: Implications for the Late Pleistocene of the central Russian plain; in: Hunting and animal exploitation in the Late Palaeolithic and Mesolithic of Eurasia, G.L. Peterkin, H.M. Bricker, and P. Mellars (Eds. ), The American Anthropological Association, USA, p. 170, 1993. Oard, Ice Age, p. 83. Guthrie, Frozen fauna, p. 25.